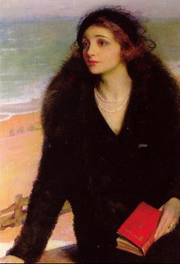 "Ursula Bloom on the Promenade at Walton-on-the-Naze" (1932) by Charles A. Buchel (1892-1984). Ursula Bloom also wrote under several pseudonyms, including Lozania Prole, Mary Essex, Rachel Harvey, Sheila Burns, Deborah Mann, and Sara Sloane. The daughter of a clergyman, Ursula Bloom got an early start on her literary career at age 10 by running a children's magazine. She worked as a pianist in the cinema before marrying a wealthy lawyer, with whom she had a son. Following her husband's death during the influenza pandemic of 1918, she and her young son continued living in the exclusive seaside resort of Frinton-on-Sea in Essex. During this time, she became a journalist and also had a successful career as a court reporter, before marrying her second husband, a naval officer. She became one of Britain's most prolific romance novelists, publishing more than 400 books beginning in 1924. She also wrote her father's biography, Parson Extraordinary (1963), and a book about her great-grandmother, who was of gypsy origins, The Rose of Norfolk: Frances Graver (1974). Ursula Bloom is currently considered a "single author." If one or more works are by a distinct, homonymous authors, go ahead and split the author. Ursula Bloom is composed of 9 names. You can examine and separate out names.